1. To become more physically, mentally and emotionally healthy. 2. To focus on helping my son into adulthood and being present with him and understanding of his limitations and abilities. 3. To find a way to become a therapist in the direction in which the Goddess leads me. 4. Continue to let go of the past and learn to live in the present and not to spend too much time obsessing about the future. One thing that I have learned to trust although it is still really hard is that when you put an intention out there and focus on it, you have to understand that it may not come to fruition the way you planned or thought it would. 1. I started walking. I have not been as consistent as I have wanted about it but I am making progress AND I did a 5K walk this year. I also have been getting allergy shots which have paid off already in helping me in this fall season to breathe. I continue to work on myself emotionally. 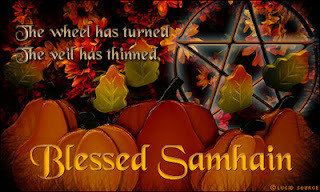 The Hunter's or Harvest Full Moon is the first full moon after Mabon (Autumn Equinox). The Hunter's Full Moon is named because the full moon give light to hunters tracking their prey before the cold winter settles in. They are able to stock up on the protein they will need to make it through the winter. I myself am doing that in a manner of speaking. I went to the conference to "stock up" on more learning material and to socialize before the cold settles in and we look inward and do less outside socializing and more family bonding. I have started setting up my new office and making sure I have everything I need to do therapy. I find this a good time to seek out that which you will need in order to work within yourself during the dark time of the year the time of reflection and integration of new ideas and work from the previous year. I am working on writing and organizing so that I can continue to work on myself.